After Nano War, here is Phage Wars, a new Flash remarke of Galcon, a strategy game developed by Phil Hassey, which is itself a remake of an old 80s game called Galactic Conquest. Just like in the original, your goal is to spread your parasites to annihilate your enemies and become the “Dominant Species”. Click one of your cells and drag to a targeted cell to send half of your parasites to their new destination. If their number is higher than the enemy units, the cell turns your color. Phage Wars offers multi-enemies levels as well as 8 different types of parasites, each with their own characteristics (speed, strength, agility). 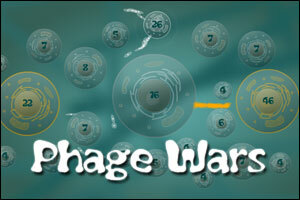 Phage Wars is better than Nano War in graphics and replayability, but is less challenging. This game is very addictive but, the AI of your opponents is (very) poor, and it won’t be long before you complete the game and become the Dominant Species! Important note: Flash Player 10 required! @monte – Upgrade to Flash Player 10 and it should work! Grab the gray guys and spread worse than rabbits. spread, spread, spread. big bubbles first, smaller later. and spread faster. FASTER! Well, it was a good game, but eventually started to go really s… l… o…. w… so I closed it. I completed one species and now I can’t play it again! Hmm… wish they had fixed that. not a bad game, generally if u want to win firstly gather up cells, and then concentrate 5 of your bubbles on one of the oppositions big bubbles, and that way you should overpower them. I got stuck on level 17 or 18. When you cant turn the enemies back into your colour. They permanently become one colour. Astro, there are no levels where you can’t turn enemies back into your color. What changes at around level 16 (I think – the way it shows the level number after the AI has already started attacking is really annoying) is that it no longer tells you how many attackers your enemy has – you have to guess based on the size of the cell and whether it has attacked recently. Does anyone know if it gives you any bonuses for being the dominant species on every level, and/or never going extinct on any level? I’ve never managed to achieve either. I do know that finishing every color doesn’t get you anything special – it just resets every color so you can play them again. James, I’ve gone through several resets, so I know about that. My question was, does anything different happen if you had a “perfect game”? I.e. “dominant species” on every level, and no going extinct on any level? I’ve since figured out that it doesn’t do anything special if you manage to get dominant species on every level but you go extinct at least once (so that you have to retry one or more levels). It probably doesn’t do anything special for a perfect game, either, but I’d still like to know for sure. Yay, i got to the end! it was rather enjoyable!! If you want to win with all Species in about 5 mins there is a trick I just found out. It´s a little bit boring but you can make all species dominant. Just finish the first Level (It´s the really easiest level) and when the message “infection completed” appears you need to hit the Spacebutton (to pause the game) rapidly. After a few seconds the Winningscreen appears and you have won the game with your species. what do speed, strength and agility do specifically? How many levels are there in phage wars? I dont get it! any help?? Posted on Wednesday, November 19th, 2008. Follow any responses through the RSS 2.0 feed.